Some spare change for the local grocer, anyone? A long-time merchant in Stardew Valley, Pierre is the go-to guy for everyday foodstuffs... or at least he was until some big-name competitors moved in. Though he maintains a fairly cheery demeanour most of the time, Pierre has something of a nasty streak when it comes to discussing his competitors, and yearns for the day when he can give his chief rival a good punch in the face. Pierre is the owner of Pierre's General Store, and he keeps the place open every day except Wednesday. He lives there with his wife, Caroline, and his daughter, Abigail. 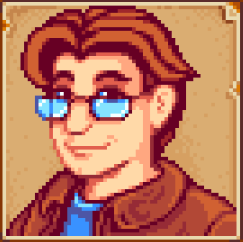 He's typically the first NPC you'll visit for monetary exchanges upon hitting a new season, as Pierre sells the Seeds you need for planting and growing crops. Pierre spends much of his time complaining about JojaMart, his fiercest competitor in the buying and selling of foodstuffs, and he gets a pretty great scene with JojaMart manager Morris if you complete the Community Center quest. Pierre's birthday is on the 26th of Spring. Pierre likes prepared meals, and there's nothing he likes more than Fried Calamari. Not easy to whip up, perhaps, but good for his birthdays. He also loves Sashimi, Maki Rolls, Omelets, and Spaghetti, as well as any Milk and Eggs you might have. He likes some produce, yet despite his job you're better off just selling him any spare fruits or veggies you might have. Despite his love of fish dishes, Pierre absolutely hates getting raw fish as gifts. Creatures pulled from Crab Pots don't get a great reception either. Pierre is perhaps second only to the Wizard in predictability. He works from 9 am until 5 pm at his Store, then closes up shop and spends the rest of the night wandering around his home. On Wednesdays, when the Store isn't open, you simply won't see him. The only time Pierre comes outside is on Fridays, when he'll head to the Stardrop Saloon after work for a few hours. Once the Community Center has been restored to its former glory Pierre will keep his Store open on every day of the week, presumably because JojaMart has gone bye-bye. At three hearts Pierre will send you the Blueberry Tart recipe in the mail. He'll also occasionally send you 'rebates' in the form of gold. At six hearts you can get a scene with Pierre in his home, after working hours. It bears repeating that Pierre gets a pretty epic scene with Morris if you complete all of the Community Center Bundles.